When we go for a walk our body is using energy by making our muscles work. Typically over a 30 minute walk you might burn about 150 kCal. This doesn’t sound like much, in fact its about the same amount of energy as you would obtain in a 150g serve of low fat yoghurt. When you are exercising to lose weight, you will find that your motivation to continue is dependent on the results you see on the scales. Of course when you realise that you would need to walk for more than 100km to lose a kilogram of weight, it can be a little discouraging. If you are going to be successful in losing weight, you will need to look closely at how you are eating. It is much simpler and easier to make some changes to what you are eating to acheive similar results as taking that 100km walk. For example if over a week you stopped using butter on your bread, changed to low fat milk, had a sandwich instead of a pie and a piece of fruit instead of a 70g chocolate bar you would lose close to a kilogram. 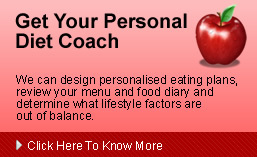 It sounds simple, however you know as well as I do that you need a diet coach to help you stay on track. This is where we can help. Why not email us or call today.